Are you getting anxious about labor? Already stressing out about the lack of sleep and exhaustion? Already worrying about how hard it will be to lose your baby weight? In both of my pregnancies, I couldn’t sleep for like the last 3 weeks because I was so anxious and nervous. I know how nerve wrecking it is! But listen, it’s all about making a plan. When you have a plan and you stick to it, it makes everything much easier. 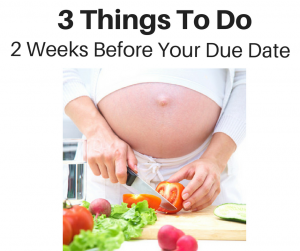 So, today I want to share with you 3 things that I did a few weeks before my due date that helped me tons. 1. Make 2 weeks worth of meals and freeze them. Make sure there aren’t a lot of veggies in them if you are nursing. This will help you to eat clean right after delivery which will help you shed those baby pounds WAY FASTER. People will be so nice and bring you over meals (which usually are not very healthy). Eating poorly during this time of stress, lack of sleep, exhaustion, could potentially actually make you gain more weight. Having healthy meals ready will also take away that stress from having to cook for your hubby or other kids. So you won’t feel guilty and you will be able to feed your family healthy meals as well as yourself. I would also bake some healthy snacks and freeze them. You can find tons of recipes on my website under RECIPES. All I did was the last 2 weeks I made dinners that were kind of plain and I made double batches and froze one of them (super easy). 2. Buy some appetizers and drinks. I also did this both pregnancies. I got a bunch of crackers and cheeses and chips and dips and beer and wine and champagne, juices, etc. During the first 2-4 weeks postpartum, you have lots of visitors who want to come meet baby and see you. This allows you to not have to run out of the house to get stuff and also prevents your hubby from running to the store. I knew he would be thrilled to run out to the store and I could literally kill him if he did. 3. Commit ONLY certain times for visits. This will help you tons with your exhaustion. With my first child, I had no boundaries. People came to visit at all times and by the end of each day I was exhausted and felt like I got nothing done. I never had time to rest and I was miserable. The second time around, my husband and I set boundaries. We said that we would take no visits between 12pm-3pm. And we were able to rest and relax so much more this time. No matter who it is, set your times and make every one respect it. Listen, I know that once you pop that baby out, you will be eager to get your body back. Diet will be huge for you for the first 6 weeks so really try your best to eat healthy. There are also some exercises you can do during the 6-Week wait that are safe and actually really beneficial. I go through them in my BETTER BODY AFTER PREGNANCY PROGRAM. The postpartum phase is (I think) even harder than pregnancy, which is why I created the BETTER BODY AFTER PREGNANCY PROGRAM. To help you go through this time way easier, lose your baby weight faster, get you body in better shape than pre-pregnancy, tighten your skin and flatten your belly, get organized, make YOU time and be and feel super productive. It’s super hard, but its so achievable. I would love to help you do all of that. If you would feeel more at ease knowing you have a plan and a coach to help you through the really tough postpartum stage, you will love my Better Body After Pregnancy Program. P.S. You will feel so much more at ease knowing you have a plan and me ready to walk you through the whole postpartum process from the moment you get home from the hospital.